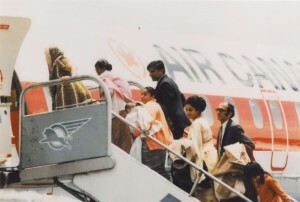 Ugandan Asian refugees board a plane for Canada, 1972. NHQ/AC Roger St. Vincent Collection PH-437. “Asian immigrants have already added to the cultural richness and variety of our country, and I am sure that those from Uganda will, by their abilities and industry make and equally important contribution to Canadian society” – Prime Minister Pierre Trudeau, August 25, 1972. This was Prime Minister Trudeau’s defence of the decision to deploy an immigration team to Uganda in August of 1972. Following the widely-publicized expulsion of Uganda’s South Asian population by President Idi Amin, the Canadian government admitted almost 8,000 Ugandan Asian refugees. This represented the largest resettlement of non-white, non-Christian refugees in Canada up to that date. As we contemplate the current government’s response to the Syrian refugee crisis, it is worth reminding ourselves of one of the earliest cases of non-European refugees being resettled in Canada. 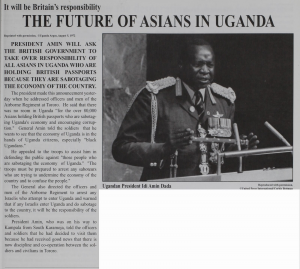 On August 4th 1972, Ugandan President Idi Amin declared that there was no room in the country “for the over 80,000 Asians holding British passports who were sabotaging Uganda’s economy and encouraging corruption”. The President ordered every Asian to leave the country within ninety days, threatening that those remaining would be sent to rural communities as farmhands. Even before that decree, South Asians living in Uganda were caught in a precarious position. Regardless of their deep historical roots in the country, they were seen as colonial collaborators. This was a direct consequence of the country’s colonial inheritance. Ugandan Argus, August 5, 1972. South Asian migration to East Africa began in the 1840s, encouraged by imperial connections and economic opportunity. Two groups of migrants came specifically to Uganda. The first consisted of indentured labourers who worked on the construction of the Ugandan railway. The second, larger group were merchants, traders, and moneylenders who typically opted for voluntary migration. Once in Uganda, these migrants became part of a three-tiered colonial hierarchy of class and race. As was the case in other East African colonies, the colonial government reserved the upper ranks of civil service for Europeans, mid-level positions for Asians, and lower levels for the local population – in this case black Ugandans. Segregation also manifested itself in separate schools, hospitals, and residential neighbourhoods. Over time, Asians came to dominate the Ugandan economy. By the 1970s it was estimated that their businesses controlled eighty to ninety percent of Ugandan trade, and eighty percent of the commercial market. Their economic success, as well as advice from friends and family, increased the number of Asians in Uganda from 5,604 in 1921 to approximately 80,000 in 1972. After Ugandan independence in 1962, efforts were made to “Ugandanize” the economy by placing economic power in the hands of black Ugandans. All those who were of South Asian decent were considered colonial collaborators, whether they themselves had Ugandan or British passports. This campaign culminated in Idi Amin’s expulsion order. 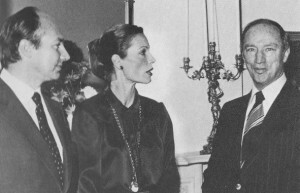 His Highness the Aga Khan and Begum Salima Aga Khan with Prime Minister Pierre Trudeau in Ottawa in 1978. Simergphotos.com. The creation by decree of so many refugees—many thousands of them stateless, others still holding British passports—precipitated an international crisis. Faced with on-going racial tension in urban areas and opposition to refugee resettlement at home, the UK government was reluctant to admit more than 50,000 South Asians. It was under these circumstances that Prime Minister Pierre Elliot Trudeau, in partnership with the Aga Khan – the spiritual leader of the Shia Imami Nizari Ismaili Muslim community—agreed to resettle almost 8,000 Ugandan Asian refugees by the end of 1974. This initiative presented the Canadian government with an opportunity. They could appease the British call for aid from the commonwealth with resettlement. Furthermore, they could also fulfill the request of the Aga Khan, who offered to pledge significant resources to help with resettlement, including a $1,000,000 donation to the Ismaili community in Toronto. Finally, this was an excellent opportunity to showcase Canada’s humanitarian spirit while simultaneously accepting a group of well-educated and entrepreneurial migrants. Of the initial group of refugees, more than fifty percent possessed at least twelve years of schooling. Although Canada signed the UN Convention of Refugees in 1969, they did not immediately create a formal refugee policy. According to the latest amendments to the immigration Act made in 1967, Ugandan Asians fit within the oppressed minorities clause, but they were not labeled as refugees within any government documents. This protected the government from being forced to relax immigration selection criteria, something they would do later with the arrival of Indochinese refugees in the late 1970s. Many at the time viewed the resettlement as a resounding success, as evidenced by Ugandan Asians’ rapid integration into Canadian society. In December of 1972, approximately 3300 Ugandan Asians were receiving some form of government subsidy, but within only ten months this number had dwindled to fewer than 150 people. The federal government provided funds for a six-month period, enabling special ad hoc assistance committees to operate in twelve settlement centers across Canada. In a follow-up survey one year after the arrival of Ugandan Asians to Canada, eighty-nine percent of respondents who had wished to enter the labour force had done so, and more than ninety percent planned on staying in Canada permanently. The Popat family arrives in Montreal on November 4, 1972. Daxa Popat/Pier 21. The Ugandan Asian committees provided an additional resource for refugees. Participants on these voluntary committees included members of groups like the YMCA and UNICEF, city councils and local mayors, Indian cultural associations, and religious groups. They held meetings and short courses on Canadian society, and encouraged the new arrivals to ask Canadians for help. 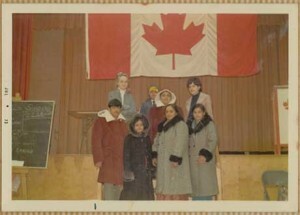 As Citizenship Branch documents like Your First Few Months in Canada (1972) exemplify, there was a direct emphasis on spreading knowledge about Canada and its customs. For example, literature outlined the difficulties of the Canadian climate, something my mother and thousands of other Ugandan Asian refugees personally struggled with. Committee members encouraged Ugandan Asians to make the most of the winter months. Beyond advising them to dress warmly, and assuring them that central heating was universal throughout Canada, they also advised refugees to participate in winter activities. The Canadian government issued department store vouchers for refugees to purchase winter clothing and even a pair of ice skates. Although there was concern regarding high levels of unemployment in Canada, and whether Ugandan Asians would be loyal to their new country, the few critics of the settlement were overruled by government officials and the Canadian public. Editorials stated that Canada had a humanitarian duty to aid those who were being expelled from their homes by a brutal dictator. Citizen groups, meanwhile, argued that Canada had a responsibility to admit Ugandan Asians, in part to to atone for a racist immigration policy that had prohibited the migration of South Asians to Canada in the early twentieth century. Finally, Prime Minister Trudeau justified the government’s position on helping those in Uganda with an appeal to Canada’s humanitarian past, arguing that “[w]e would not have been Canadians if we had turned our backs on them”. The experience of the Ugandan Asians reinforces the importance of collaboration between government and citizens in creating a welcoming and inclusive environment for newly arrived refugees. If we want to replicate this example, public funding is essential for the numerous settlement agencies that will help refugees integrate into Canadian society. The federal government spent almost $5 million on the resettlement of Ugandan Asian refugees. That public funding, alongside the aid of hundreds of volunteers, facilitated the resettlement process. Today, faced with the plight of the Syrian refugees, Canada needs a strong political commitment to devoting adequate resources to a resettlement initiative. There will need to be a qualified team of immigration officials in countries currently hosting Syrian refugees to assist in issuing visas and providing transportation. If Canada is to accept more refugees from Syria, political will, public resources, and the creation of settlement committees are imperative for their successful resettlement. Shezan Muhammedi is a PhD candidate in History at Western University. His research focuses on the experiences of Ugandan Asian refugees in Canada. Read more here. Writer omits to mention Kutchi mariners and traders siling to zanzibar over centuries before due to the monsoon trade winds. Zanzibar’s Stone Town is a replica of Mandvi and Mundra but is not from colonial factor. in 1497 Vasco Da Gama reaches India thanks to Kutchi mariners. Settlement by Asians or Europeans or anyone else is untenable since Africa must be left for the Africans. It is normal for outsiders to be seen as outsiders everywhere. I speak as fourth generation Ugandan of Indian origin (both my grandmas were born in Zanzibar, father and I in Uganda), stuck in UK whilst sent out 18 months before for further studies. Would add more salt to the article by comparing and contrasting to the British policies for resettlement of Ugandan Asians. A vastly larger number resettled in the U.K. and also thrived, in contrast to other refugee groups, in fact Ugandan Asian immigrants to the UK represented perhaps the most successful migration wave to the Western world period (perhaps more successful per capita than Jewish refugees to the US). I believe their success is more attributed to themselves (very educated, business oriented, with many connections, and likely had a lot of money stored overseas, to avoid Ugandan officials confiscating all their wealth). It would be foolhardy to assume the same result would occur for other less educated & business savvy refugees.